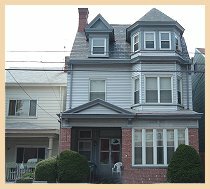 The Millvale CRR is a state licensed 7 bed program (4 males and 3 females) located at 405 North Ave in the heart of Millvale. Our main program focus is on the Recovery process and the implementation of goal plans that will assist residents with becoming more independent. Millvale has had only 1 psychiatric hospitalization in the last year which was voluntary. In the past year 57% of the residents have participated in work, school or volunteering in the community. At this current time 5 of 7 residents are ready to be discharged into their own apartments in the community. Our site tortoise “Misty” continues to be therapeutic with the residents.